What is soybean oil? It’s the most commonly used ingredient in the United States and the top dietary source of omega-3 fatty acids. In fact, the United States is the world's leading soybean producer – accounting for 33 percent of global production. So, it wouldn’t be surprising if the new heart-healthy claim boosts soybean farmers’ productivity and revenue. What kinds of food and menu items use soybean oil? Soybean oil is a popular ingredient in a variety of foods, thanks to its neutral flavor that doesn’t interfere with a food’s natural taste. Popular items that incorporate soybean oil include fried chicken, French fries, salad dressings, baked goods and crackers. What does this mean for consumers? Heart health is the number one thing consumers look for when grocery shopping, according to Hartman Group data. Fifty-five percent of U.S. consumers try to avoid or reduce saturated fat in their diets, and almost 40 percent try to consume healthier fats, like polyunsaturated and monounsaturated fats. Soybean is economical. Soybean is one of the more cost-savvy oil options. High-oleic canola oil and peanut oil are the most expensive options. Premium soybean oil adds durability. Clear soybean oil, along with canola and corn oil, has a lower durability than solid oils when it comes to fry life. That’s where premium soybean oil gives you extra durability. You can count on soybean for safety. Soybean oil is one of the safest and easiest types to handle when frying, whereas tallow and palm rank the lowest. Thanks in part to its liquid form, instead of solid, soybean oil can be managed through a closed-loop, automated system like Total Oil Management from Restaurant Technologies. Soybean scores an A for nutrition. Soybean is a healthier oil option with 0 grams of trans fat per serving and 3 grams of saturated fat per serving. With its new heart-health claim, consumers can wave off guilt by knowing there is nutritional value with this oil. By staying abreast of trends influencing the industry, and having a better understanding of the type of oil purchased and how to manage it, food and restaurant professionals can leverage the heart-healthy benefits of soybean oil while still serving consumers deliciously fried foods. Does your kitchen need an oil change? 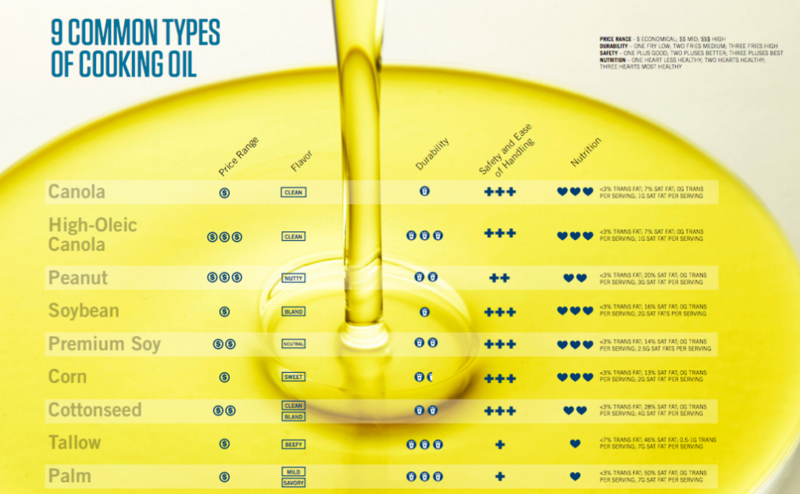 Download our free guide on selecting the right cooking oil for your restaurant.